To visit Yasukuni, an amusement park of death, is to reject the principles that have made postwar Japan great. Global society, in which modern Japan plays a huge part, rejects the concept of service unto death being ennobling irrespective of the regime for which it is done. As for the core trade off in Yasukuni's founding ideology -- the Emperor is a kami but you, poor peasant, are not and will never be...unless, of course, you die in the service to the Emperor, at which point we have a promotion option for you -- it is meaningless in a world where the Emperor renounces his divinity. 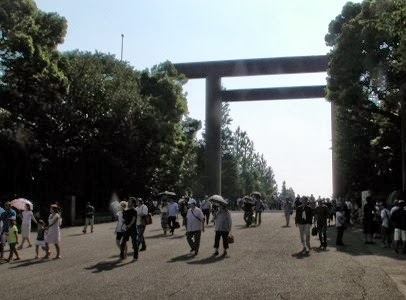 Which highlights the real paradox at the heart of post-1979 Yasukuni sampai: while Yasukuni is a religious site, the goal of a pilgrimage there is almost never to show reverence. The goal instead is to transgress -- to thumb one's nose at polite global society, to thumb one's nose at Korea and China (which, when you go to Yasukuni, you further prod with the derogatory appellation Shina rather than the neutral Chugoku), to thumb one's nose at the San Francisco Peace Treaty, to thumb one's nose at the Military Tribunals for the Far East, to thumb one's nose at the leftists and members of religious orders who suffered under the Meiji Constitution regime. Contrary to my guess of a month ago, Prime Minister Abe Shinzo again stepped away from a confrontation with China and South Korea over a visit to the shrine. Despite having his hand slapped away, figuratively, by Chinese president Xi Jinping and South Korean president Park Gyun-hye in Indonesia (the very sharpest take on the snubs being this article), he restricted himself to yet another visit-via-symbolic object (Link). He has, given his proclivity to fly off the handle at challengers (Link) stayed remarkably true these past few months to a course of inaction on Yasukuni. It is as if, with the deeply China- and South Korea-invested big business establishment as his new spirit guide, he has taken to heart the lesson of patience and forbearance in Ferengi Rule of Acquisition #109 ("Dignity and an empty sack is worth the sack" - Link). Of course, the recent quiet but pointed wreath-laying by the U.S. Secretaries of State and Defense at Chidorigafuchi can probably be seen has having slammed the door on any consideration of a Yasukuni autumn festival visit. However, as the TBS video above concludes, Abe has limits on how much longer he will delay a prime ministerial Yasukuni pilgrimage. Chinese and South Korean ingraciousness can only be allowed to proceed so far without a response. Furthermore, Abe must in someway answer for his public expression of regret for having not made the journey to Yasukuni during his first stint as prime minister. Finally, though perhaps this is less of a threat than it might seem, he has to address the growing chorus of outraged supporters (check out the comments section on Abe's Facebook page -- the formerly overflowing waters of the Sea of Abe Shinzo Fandom are drying up) who have been wondering when the Yasukuni Commuter Real Abe they know and love will show up. Michael, you write that "To visit Yasukuni, an amusement park of death, is to reject the principles that have made postwar Japan great. Global society, in which modern Japan plays a huge part, rejects the concept of service unto death being ennobling irrespective of the regime for which it is done" but I think this extract (of a blog with which I generally agree) contains two ideas that are provocatively contestable. (1) that the thing 'what has made postwar Japan great' can be so clearly isolate-able from the source of greatness in pre-war or wartime Japan. And that having been isolated, this thing is foreign to the spirit of 'service unto death'. What then precisely is the distinction in the source of pre-war Japan and post-war Japan's greatness that has anything to do with attitudes towards this notion? 2) that the notion of 'service unto death being ennobling irrespective of the regime for which it is done' has been rejected by 'global society'. First, where is the voice of global society in this rejection? Where is this u-turn in 'global society's' attitudes recorded? Second, almost every nation state that makes up a considerable part of anyone's measure of 'global society' relies still on this notion to recruit, motivate and reward those it puts under arms. The bigger the role nations play in 'global society', the greater the chances that they still play the tune of 'dulce et decorum est', don't you think? Excellent column. I especially like the line "To visit Yasukuni, an amusement park of death, is to reject the principles that have made postwar Japan great." I am so tired of wire stories that give the impression that the only problem with Yasukuni is that Class A war criminals are enshrined there, when in fact it embodies what Orwell in "1984" described as the ruling ideology of Eastasia: Death Worship. As you indicate, military discipline requires admiration for one's opponent and, when it happens, his/her willingness to sacrifice himself or herself. At the same time, the international system does not accept the concept that one was just following orders as a sufficient defense for one's actions while in service. Given that military service in an evil regime is by definition carrying out evil orders, to salute the ultimate sacrifice has become less and less tenable. Politics in the immediate post-1945 era required looking the other way and forgiving a lot of unforgivable folks, or being complicit in the cover up of their crimes. However, there is less and less of such forgiving and forgetting nowadays. Those who serve evil regimes are now seen worthy not of mere defeat -- they must be annihilated or imprisoned. As for the common soldier he/she is a lot less common nowadays. The postwar treatment of them has become far less kind and more punitive than in decades past. I am afraid I still find "the international system" a bit evasive, if less so than "global society", which sounds like something different as well. The International Criminal Court may be the kind of system you have in mind, but its work is far from being as near completion as you imply. Think of all those great powers who don't sign up to the Rome convention. If Washington, Beijing, etc had done so, I might find it easier to accept your argument. I also think your contrast of the post-1945 climate with that of today is a little exaggerated. I don't think we have to go as far as applying labels like 'evil' to regimes that are served by people who are honoured, in spite of the cause and results of their service being anything but honourable. Our recent wars in Iraq may be criticised and that criticism respected in normal public discourse. One may safely assert that these wars were illegal, or even a crime without feeling that this is taking a career risk of any great consequence. But try criticising the troops that served in these wars...and see what kind of reaction you get then. Legal or not, those who kill and die in the name of such a war are still saluted as much as the Vietnam veterans McCain and Kerry. It is still taboo to hold today's troops to account for the orders they followed. Instead we have to follow them (advance boarding for those in uniform? militarism at its most sickly sweet extreme). Even ICC and other war crimes mechanisms go for the leaders, not the foot-soldiers. Also, your logic about 'military service in an evil regime is by definition carrying out evil orders', seems a bit pat. Were Stalin's red Army evil by definition even when they repelled the Nazis? It doesn't add up as neatly as that. Times have changed, Though we might wish to deny it, enemies are more dehumanized now than they were in the last century. Let us agree to hash this problem out over coffee the next time you are in Tokyo.